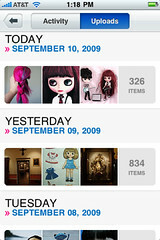 There’s a new native iPhone app for Flickr, created by Yahoo’s mobile team. It’s currently available in English and French in the US, Canada, UK, France, Hong Kong and Singapore Apple iTunes stores. Download it for free now! You can take a photo and upload it from the app, view your photostream and activity, and see recent photos from your contacts. There’s also the nifty slideshow that features the “Ken Burns effect”. There are a lot of ways to use Flickr on your mobile device. There are a whole lot of third party iPhone apps that work great with Flickr, including Mobile Fotos, FlickIt and Darkslide. And of course, you can always use m.flickr.com, our mobile browser experience that’s available across hundreds of devices in 21 countries. Finally, there are several hardware manufacturers including BlackBerry and Nokia who have built in “send to Flickr” right from their phones, which we love! Learn more about using Flickr on your mobile device. Cheerio! Screenshots from morganannie, diceliving, anitakhart. Photos from jcolman, Heidi & Matt, Luka Skracic, Chicken®, Dr. Jaus, Lo Li, brown-dog, kiplingflu, and nathalie booth. Photos from -rt-, darko82, rubensc, kimprobable, giuli@, and raqalmeida.